After working in the ego-centric advertising and film industry and now in advanced metaphysics over four decades, I promised myself to never write an auto-biography dropping names of those with whom I had worked with (God, Archangels Uriel, Gabriel, Gabriel and Michael, George Lucas, Paul McCartney, St. Germain, Ridley Scott, Steve Jobs, Elizabeth Taylor, Michael Jackson, Bette Davis, and Charlie Chaplin, just to name a few) or talk about what we accomplished together UNLESS my ‘story’ could benefit others- perhaps to stimulate readers to create their own stories of self-empowerment, to know we are all essential aspects of the whole of humanity….or we would not be here. 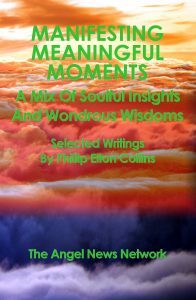 MANIFESTING MEANINGFUL MOMENTS holds a collection of ‘disguised’ biographical data and a mix of soulful insights and cosmic wisdoms to INSPIRE readers to tell their unique life story. It assists in a “resetting of our individual and collective soul plan compass,” our reason to be here reflected into the world. It is the product of several forces operating simultaneously and independently. Through the first chapter, “ I RECALL” memories, a meaningful life comes into focus. Beyond biographical articles, poems, quotes, definitions, prefaces and introductions from past endeavors we see the power of the written word creating the course of (our) lives and history. If you remember only one thing from this book, let it be that you know, accept and understand it is our divine birthright to be in full co-creative partnership with the forces that creates us ! 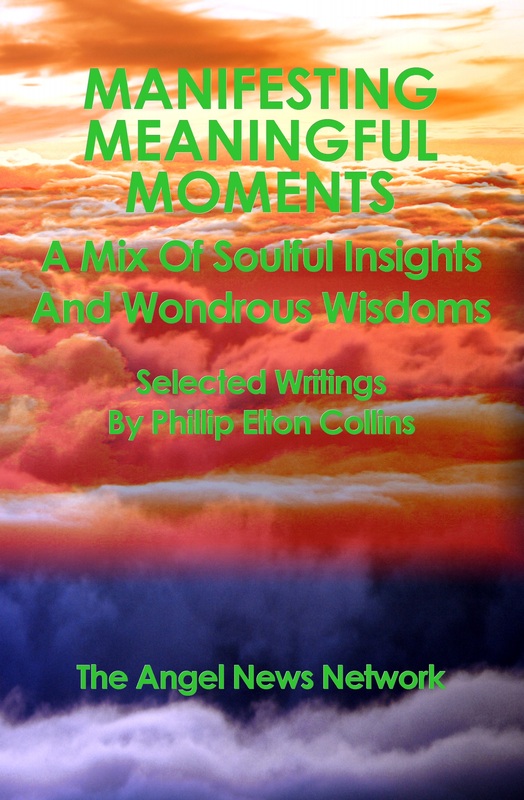 PHILLIP ELTON COLLINS brings a diversified background to this tenth book being a co-founder of The Angel News Network, Light Ascension Therapist, author, and channel of higher realms. Phillip is also a teacher and medical intuitive/life coach, addressing the energetic integration of emotional, mental and physical bodies. His career includes being Director of Marketing for George Lucas’ Industrial Light & Magic Commercials; founder of Fairbanks Films with film directors Ridley and Tony Scott, and advertising executive at Young & Rubicam, New York City. Phillip’s earlier books include: CREATING A WORLD OF LOVE, PEACE, EQUALITY, HARMONY & BALANCE; SAINT GERMAIN’S SEVEN ASCENSION DISCOURSES; DIVINE DISCUSSIONS: Higher Realms Speaking Directly To Us… ; GOD’S GLOSSARY: A Divine Dictionary, Definitions To Change Everything; ACTIVATE YOUR SOUL PLAN: Angel Answers & Actions; HAPPINESS HANDBOOK: Being Present Is The Present; MAN POWER GOD POWER; SACRED POETRY & MYSTICAL MESSAGES, To Change Your Life & The World, and COMING HOME TO LEMRUIA, An Ascension Adventure Story.